Solomon Exam Prep—a leading publisher of securities exam prep materials—is proud to announce a partnership with Ohio Dominican University. With this partnership, ODU students will get everything needed to pass the all-important SIE exam. Perhaps most importantly, Solomon’s materials are complemented by personalized support. As one student noted, “I didn’t think this kind of customer service and general human kindness existed anymore.” The company’s dedication shows in its consistently high pass rates. Contact us at 503.601.0212 to discuss setting up a Solomon partnership for your school—and to join such prestigious institutions as the University of Nebraska-Omaha, Adelphi University, Seton Hall University, and the University of Dallas. 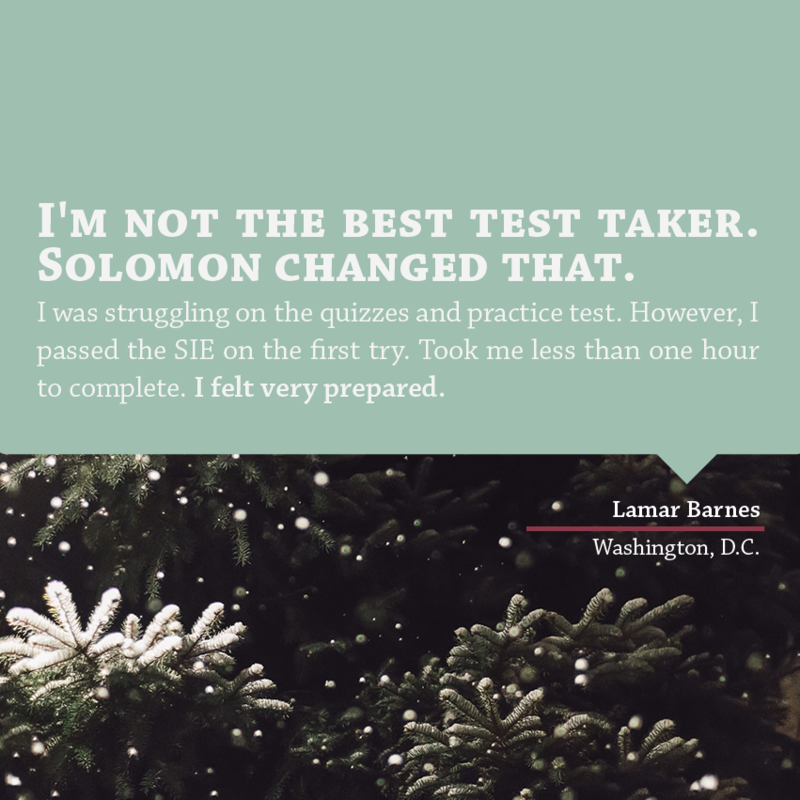 Founded by Karen Solomon (Ph.D., University of Chicago) and Jeremy Solomon (MBA, Wharton), Solomon Exam Prep has helped thousands of students pass their series exams: Series 3, 6, 7, 24, 26, 27, 28, 50, 51, 52, 53, 62, 63, 65, 66, 79, 82 and 99. Henry buys shares of ABC in an initial public offering. Two months later he sells the shares to James. Two months later James sells the shares to Carrie. Which of the following is true? Answer: D. When an investor buys shares in an IPO from the issuer, the purchase is a primary market transaction. After that, whenever sales of the security are traded from investor to investor, and not from the issuer to an investor, the sales take place in the secondary market. Thus, while Henry’s initial purchase is a primary market transaction, his sale to James and then James’ sale to Carrie are both secondary market transactions. 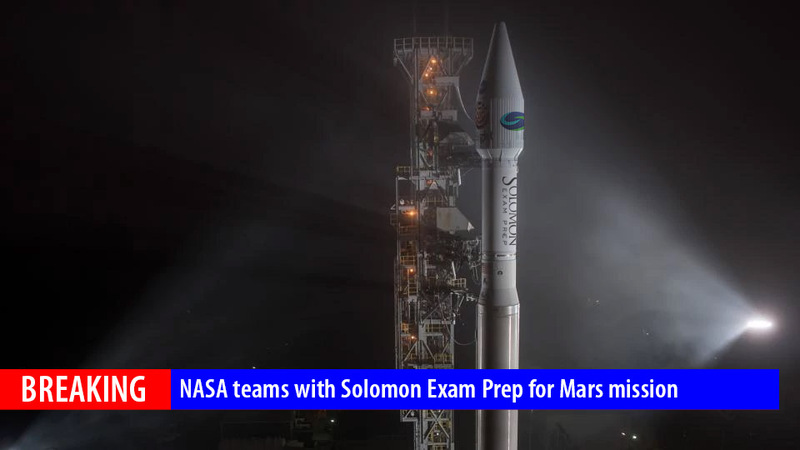 In preparation for the October 1 launch of the Securities Industry Essentials (SIE) exam, Solomon Exam Prep teamed with NASA to send Solomon SIE exam study materials to the Red Planet. Unlike other FINRA securities licensing exams, the SIE exam will be open to anyone 18 years or older who is interested in the securities industry. FINRA has not publicly stated whether Martians will be permitted to take the SIE exam but since FINRA is dedicated to “investor protection” and to promoting “market integrity” Solomon takes the position that investors and markets on other planets can benefit from securities education, and the SIE in particular. Solomon has helped thousands of earthlings pass their Series 7, Series 6, Series 65, Series 63, Series 24, Series 50, Series 79 and other securities licensing exams. Elon Musk has not responded to the news of the joint NASA/Solomon Exam Prep mission. The Securities Industry Essentials (SIE) exam comes bearing more gifts! Not only does the SIE help individuals break into the securities industry, it also provides some incredible opportunities for employers. Summer internships offer firms a way to stay young and grow. College students or recently graduated students are the future of your firm and the SIE makes it a lot easier to ensure your firm’s future is bright! 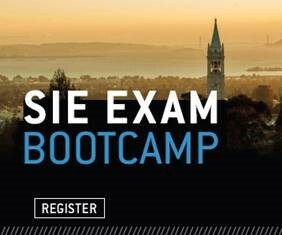 Since the SIE exam will not require BD employment or sponsorship or even a background check, what better way to help your interns succeed than have them study for the SIE exam! By giving your interns the chance to study for the SIE during your program, they will be ready to work for you full time upon graduation. You can learn more about the SIE and Solomon here. Solomon offers a complete SIE curriculum including online and print study materials. Call 503-601-0212 to offer your summer interns the educational experience they will appreciate and value for the rest of their lives! When will the SIE exam begin? What is the SIE exam going to test? FINRA states that the SIE will test fundamental securities-related knowledge, including knowledge of basic products, such as stocks, bonds and mutual funds. It will also test securities industry rules and regulations. Will I need to be employed by a broker-dealer in order to take the SIE? No, unlike current FINRA licensing exams, you will not need to have a job with a broker-dealer in order to take the SIE exam. Will a minor be permitted to take the SIE? No, you will have to be at least 18 years old to take the SIE. For how long will a passing score on the SIE be valid? Four years from the date you pass the SIE. How many questions will there be on the SIE exam? If I fail the SIE, will I be permitted to retake the exam? Yes, if you fail the SIE, you will be permitted to retake it, but you will have to wait 30 days. FINRA is maintaining its 30/30/180 day rule with respect to the SIE. This means that if you fail the SIE you must wait 30 days to retest. However, if you’re unlucky enough to fail it three times, as with other securities exams, you will have to wait 180 days to take it again. This same 30/30/180 day rule will apply to the specialized representative-level exams (the so-called “top-off” exams). If I pass the SIE, will I be permitted to take the SIE exam again, just for fun? Will SIE test-takers receive their scores? Unlike current licensing exams, FINRA has indicated that it will provide SIE test-takers with pass/fail information only. However, there has been discussion about providing those who fail the SIE with additional information about their results. If I am already registered, will I have to take the SIE? If you are a registered representative before October 1, 2018, and you maintain your registration on or after October 1, 2018, FINRA will credit you with the SIE. What if I was once a registered representative but my registration lapsed, will I have to take the SIE if I want to get back in the securities industry? If your registration terminated between October 1, 2014, and September 30, 2018, provided you re-register as a representative within four years from the date of your last registration, then you will not have to take the SIE. 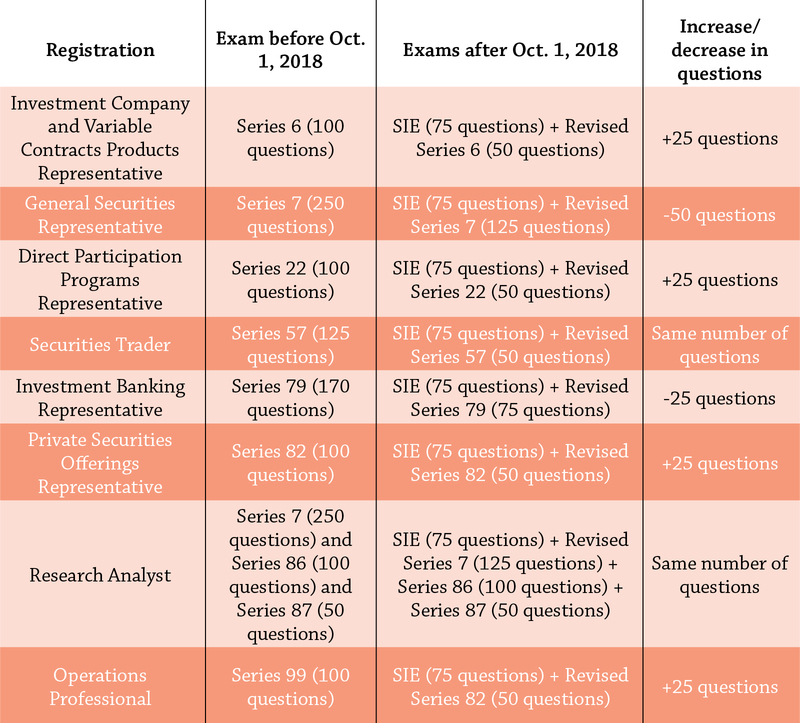 In other words, after two years outside the securities industry if you want to become registered again you will have to retake a representative-level qualification exam (the so-called top-off exams) such as the Series 6 or the Series 7. What if my registration lapsed or terminated before October 1, 2014? In order to get re-registered, you will have to pass the SIE and any relevant top-off exam, such as the Series 6 or Series 7. If I am registered in an exam license that is being retired by FINRA — such as the Series 11, Series 62, Series 42 or Series 72 – will I have to take the SIE exam if I leave the industry? Not if you leave the industry and return within two years. What if I want to become a municipal securities representative? Is the SIE relevant? The MSRB has indicated that it plans to coordinate its licensing exams with the new SIE, so after October 2018 it’s likely that in order to become a Municipal Securities Representative you will need to first take the SIE and then a revised “top-off” version of the Series 52 exam. No, in order to be registered for a particular function, you must pass the SIE and then get hired by a broker-dealer and then pass a representative-level qualifying exam, such as the Series 6 or Series 7. Will it be possible to take the SIE and a representative-level exam on the same day? Yes, as long as you reserve time at a testing center for both exams on the same day. 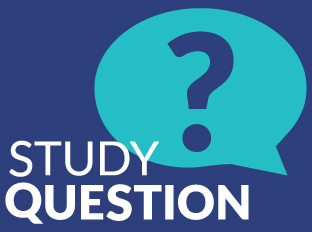 Will it be easier to pass the SIE and the revised representative level (top-off) qualification exam than it will be to pass the current representative-level exam? Unclear. A lot depends on whether you’d rather take one longer test or two shorter ones. If you’d prefer to take one longer test, you should take your exams before October 1, 2018. After October 1, 2018, in terms of number of questions, some representative-level qualification categories will require more testing and some will require less testing. See the table in the PDF for detail. Who offers the best SIE study materials and where can I get them? Go to Solomon Exam Prep or call 503-601-0212. Where should I go to schedule my exam? Will the 120-day “exam window” still apply to the SIE? Yes, FINRA will continue its system of giving test-takers a 120-day exam window during which you will be able to take the SIE. How much will it cost to take the SIE? FINRA has not published a price yet. If I am an employer and I work for a broker-dealer, will I be able to find out whether a job candidate or any individual passed the SIE? Yes, according to FINRA, broker-dealers will be able to confirm via Web CRD whether someone passed the SIE. Have more questions? Visit our SIE page!